Fishing for largemouth bass, spotted bass, channel catfish, flathead catfish, blue catfish, black crappie, white crappie, walleye, white bass, striped bass, hybrid striped bass and paddlefish at Truman Reservoir in Missouri. A sprawling 55,600-acre reservoir, Truman Lake offers camping, fishing, boating, swimming, hiking, sightseeing, and many other outdoor recreation activities. Excellent fishing for bass, crappies, white bass, stripers and other species are available virtually year round. It is considered by many to be the best catfish lake in the state. Marinas and boat launch areas are available to the public. Come visit Truman Lake real soon and bring the whole family and some fishing tackle. For those who enjoy fishing from the bank, there is over 950 miles of shoreline. Those who prefer to fish from a canoe, kayak, bass boat, pontoon or other fishing boats, there is plenty of easy access. 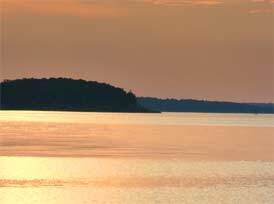 Truman Lake in Missouri offers great fishing plus boat, jet ski and pontoon boat rentals. Fishing at Truman Lake, in Missouri.